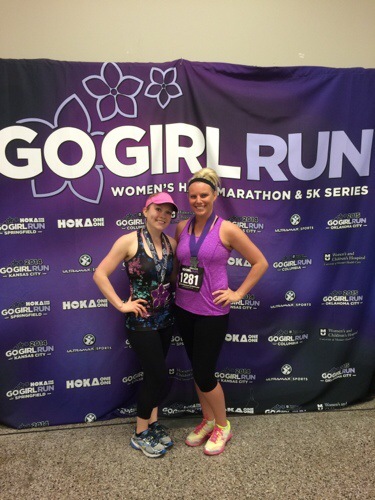 It’s been one whole week since the Go Girl Run half marathon here in Springfield! Fail for this race recap being so delayed!! But I still wanted to share my experience with you. I’ve been one busy racing lady, and each race is a truly different experience! 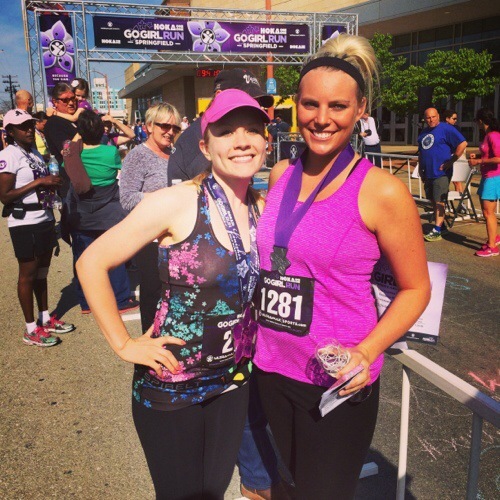 Ultramax Sports, the local running store, hosts the annual Go Girl Run race series in several cities in Missouri and Oklahoma. 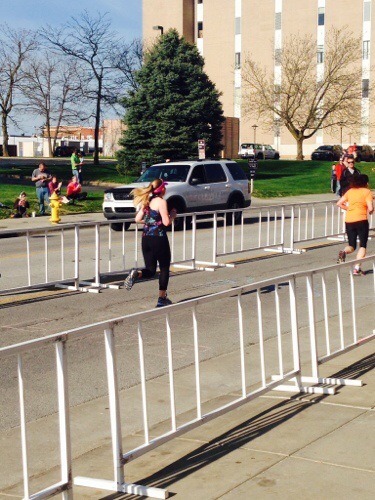 The first race of the series this year took place right here in downtown Springfield last Saturday. 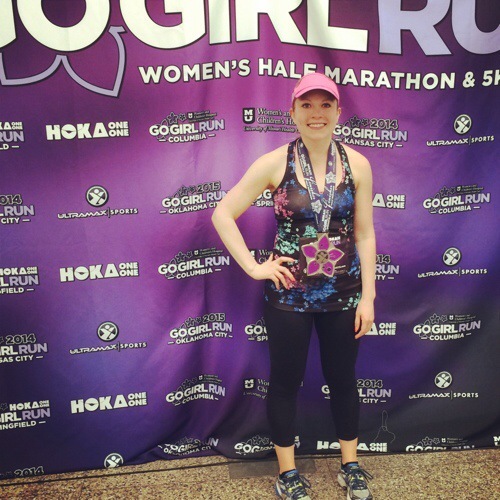 The Go Girl series offers a 5K and half marathon at each event. 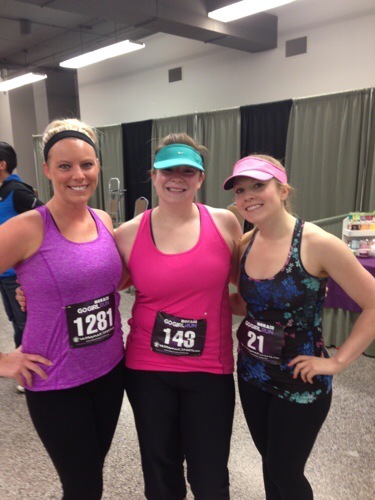 I was signed up for the half marathon, along with my girlfriend Heather. And our other friend Carley decided to run the 5K! Heather is in pink and Carley is in purple! Both events took off at 7 am. I snapped a quick selfie before leaving the house because no one was up to take my picture yet! I wore the exact outfit I wore to the Little Rock Marathon minus the rain jacket! 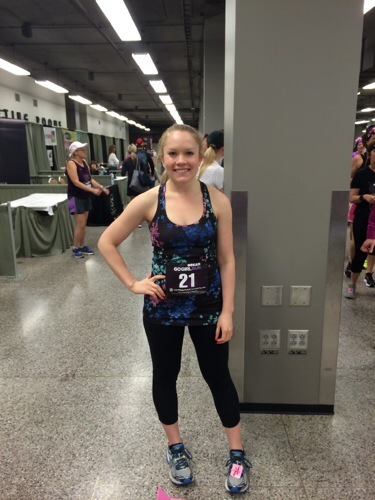 When you find a good race outfit that doesn’t chafe in all the bad places, stick with it! 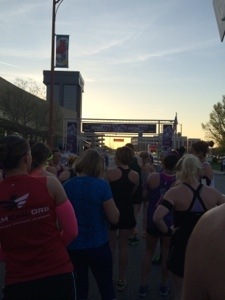 🙂 The sun was still coming up as we lined up right outside the Expo Center to start the race. It was around 50 degrees with a beautiful forecast for the whole morning. After a quick prayer and the national anthem, we took off. 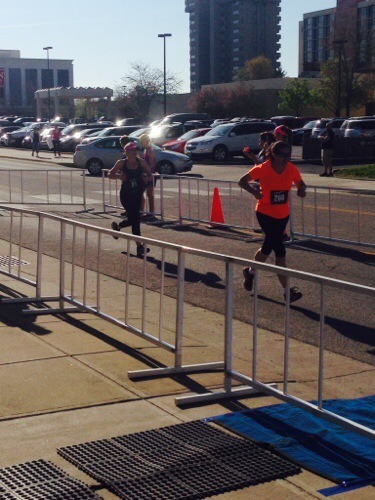 I was near the front because this event was seeded by corrals and my pacer was almost at the very front of the pack! Pacers started at 1:45 for this race. I would’ve liked a 1:55 pacer to help me gain a new PR, but they only offered a 1:50 or 2:00. So I was brave and took off with the 1:50 pacer group! As a reminder, my first half marathon was 1:56:10. So anything faster than a 1:56 would be ok by me! But you understand why a 1:50 finish would be pretty darn fast. 🙂 Regardless, after the first mile, I really thought I would be okay sticking with the 1:50 group. We were running fast, but the weather was perfect and I felt great. The pacer (a 30-something retired military guy) was extremely positive and took his job very seriously. He was so encouraging and talked us through the entire course and helped us up each hill. I was rocking along with our happy little group. And then my bladder got angry. Not again!! I had to pee. 😦 Ugh! I officially am done drinking coffee before races. Done. Finished. Finito. I thought I had it figured out but I was wrong! At mile 6 I booked it into the porta potty stop which was luckily unoccupied. I peed in 30 seconds flat and busted out of there in search of my pace group again. I wanted to catch back up with them so badly! After another mile of mild sprinting (yuck), I made it back to them… For one more mile I kept up, but mile 9 hit and I couldn’t continue at their pace any longer. Boo! I let them pull away and I settled into a more comfortable pace of around 8:40 per mile. That sprint out of the porta potty killed me but I was too determined to keep up! The rest of the course I was alone mostly. I passed a few ladies here and there but so thankful when I hit mile 13. I was bored of being by myself! But we hit a major hill – the biggest of the race – right at mile 13, so that helped my focus come back to the race and ran as hard as I could up that darn hill. I came around the corner of the Expo Center to see Nick cheering for me at the finish. I was slightly bummed as I saw the 1:50 pace group relaxing and stretching after their finish, but I was extremely happy with my own finish! 1:54:02! Woot! New PR for me! I got my big medal and met my girlfriend Carley who was sweet and waited around after her 5k for me and Heather to finish! We met up with Nick and headed into the finishers area to get a smoothie and snacks and photos! Heather finished a little bit after me and we went to greet her at the finish line. 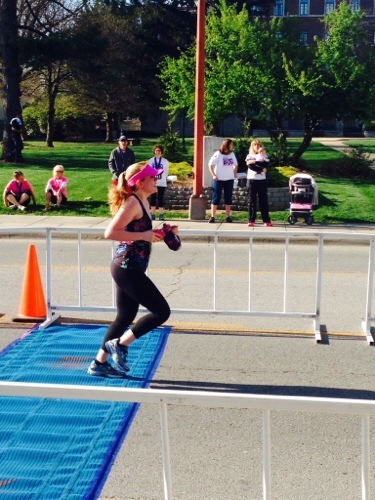 She was struggling with a blister and the rising temps, but she still finished with a smile! Nick and I headed home for showers and relaxing. I was pretty exhausted after my new PR! Mac watched over me as I put my feet up on the couch. 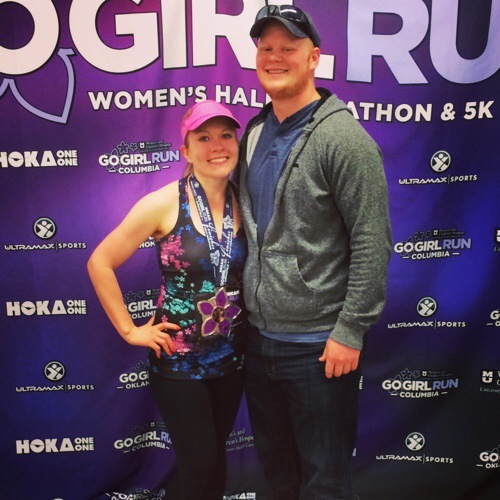 Overall, I give the Go Girl Half Marathon an A rating! It was fun, well organized, and had awesome goodies and support. 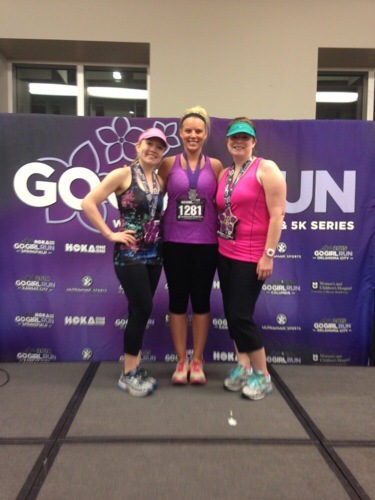 I’ve already signed up for the next race in the Go Girl series, which takes place in Columbia, Mo on May 24! It’ll be the kick off of our Memorial Day weekend! 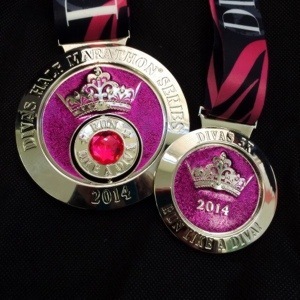 To make things confusing though, first up is the Divas Half Marathon this upcoming Sunday, May 4, in Branson, MO. Nick, Mac, and I will be heading to Branson for the weekend on Friday night. I’m hoping it turns into a nice little weekend vacay for all of us. We are staying in my parents timeshare condo right near Branson Landing where the race starts and finishes. Nick and Mac can have fun exploring downtown Branson while mommy runs! I hope you all have had a great weekend and are refreshed and ready for the week ahead. I’m afraid it’s going to be a long week for me with the anticipation of the race weekend! And so it begins…. 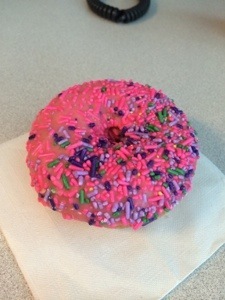 After months of marathon training and basically eating whatever I want, the calorie counting has started again. I want to say ‘Ughhh’ so bad, but I know I need to be positive and optimistic about it. In reality, it doesn’t take that much work with my Sparkpeople app. And I love waking up in the morning feeling awesome because I know I didn’t overdo it the day before. Having power over food and using it for the good of our own bodies is one of the most rewarding feelings. 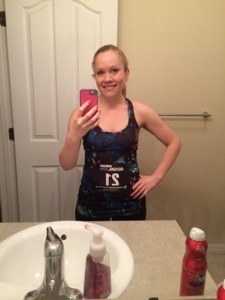 About 2 years ago, in January of 2012, I started taking Jazzercise classes. I had tracked calories on and off through college. But I got more on track with during this time and lost a few pounds. After a month or 2 as a student, I decided that teaching Jazzercise was definitely something I wanted to do. I was around 155 lbs at this point. On my petite and curvy 5 foot tall frame, I was a fairly chunky little thing. During my jazzercise training, I loosely tracked my calories (I had more splurge days than non-splurge days) and the weight continued to fall off. I was taking numerous classes a week, along with doing my instructor training. Any calories I took in didn’t have time to stick because I was always on the go! On the weekend of my instructor certification, I was down to 142 lbs. I still felt ‘heavy’ but knew that I was a million times healthier than I was even a few months ago. Through the summer of 2013 is when I got to my smallest: 119 lbs. That weigh-in was on a morning after a day of little eating due to multiple Jazzercise classes and work. So I kinda took it as a grain of salt. In reality, I think I was around a solid 120-122 during most of the summer when none of my clothes fit me anymore. 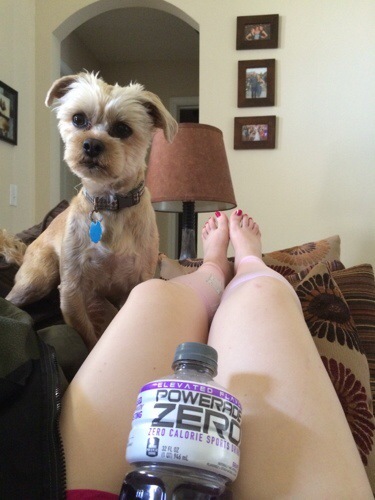 It took very strict calorie counting to get down below 128 lbs…. Which makes sense about where I am right now with my weight. 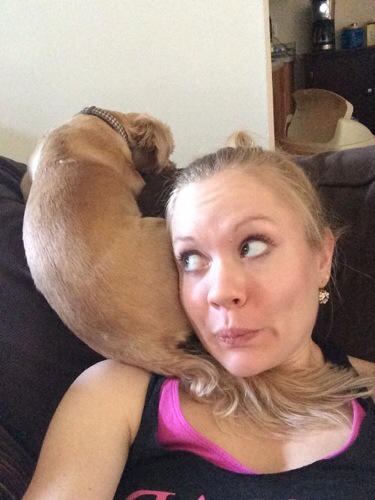 I use the Sparkpeople app to log my daily calories and fitness minutes. I have it linked with my FitBit. And those 2 things work together to make me into one lean, mean weight losing machine!… At least let’s hope! 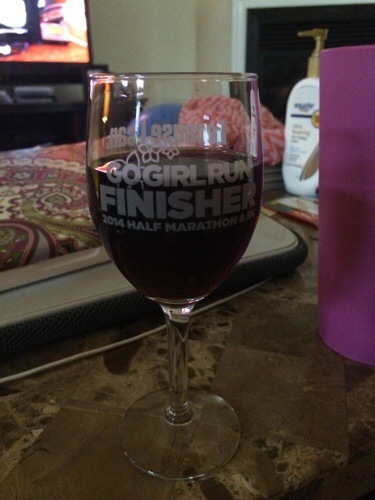 I have 2 more races I’m currently signed up for: the Go Girl Half Marathon in Springfield on April 19 & the Divas Half Marathon in Branson on May 4. I’m hoping since they are only half marathons instead of fulls, I shouldn’t have to carb load as much and derail my diet plans. Although 13.1 miles is a long enough race to carve out some room for a nice big post-race meal! I’m excited to feel completely recovered to get back to my normal training schedule to finish off these last 2 races of my spring season. I, once again, slept in past my alarm this morning. So today’s workout will happen tonight at Jazzercise instead! Nick keeps telling me to take it easy and listen to my body. Well apparently my body wants to sleep more than go to the gym this week, so that’s what I’ve been doing! Next week, there’s no excuses though!! I hope you all have a great weekend. I’m so excited to enjoy the beautiful weather!